Goalies have been told to always “keep their eyes on the puck” and “follow the play with their eyes,” lest they lose sight of the puck and it ends up in the back of their net. However, in recent years a new trend has been making its way into the crease: using your entire head to track the puck, rather than just your eyes. This technique is called “head trajectory.” It has helped pros such as Minnesota Wild goaltender Devan Dubnyk revitalize his game, but is it as “revolutionary” as some claim? Lyle Mast, founder of OR (Optimum Reaction) Sports and goalie coach for the Tri-City Americans of the Western Hockey League, is credited with developing the head trajectory technique. Former NHL goalie Stephen Valiquette has been an avid learner and teacher of the technique, saying it is more revolutionary than the introduction of the butterfly play style. Mast and Valiquette are most noted for teaching the technique to Devan Dubnyk, who in revamping his career in Minnesota, looks almost an entirely different goalie from his early days with the Edmonton Oilers. The head trajectory technique can be understood in two simple steps: first, lock your eyes in place. Imagine a racing horse wearing blinders so the only thing it can see is what is in front of it. The goalie is the most important player on the ice, and so it is imperative they have their eyes on the puck a hundred percent of the time. By locking your eyes in place and turning your head with the play, you are almost making the necessary move in advance by having your head there. Trusting your head to lead the way, your body will follow. Second, do what you would normally do in a save sequence. Goalies in the past twenty years have been taught when making a save to track the puck and move wherever it goes, leading with the hands and following with the legs. A fluid rotation is necessary to make this happen, and so it remains a vital part of making any save. However, this part comes naturally with head trajectory, as the basis is where the head goes, the body goes. To practice head trajectory, employ it in practice as well as in games. The most interesting and convenient facet of the technique is that it is not a “revolutionary” stylistic overhaul, rather a complementary tweak. Therefore, it is not risky to try in a game as it can only help if you get it right. 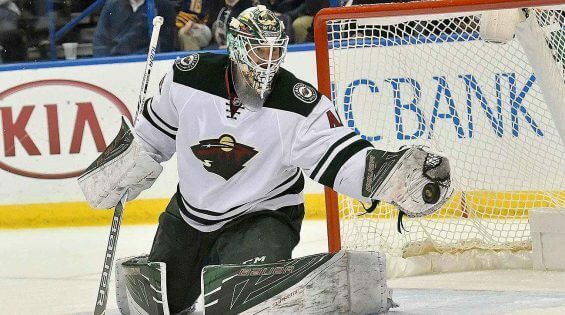 Devan Dubnyk did not completely change his style and become a new goalie, instead he became confident in his size and reach and puck watching ability. Head trajectory is an easily employable concept for any goalie at any level, and can definitely help improve awareness and decision making, making it easier to be where you need to be before a shot happens. Learning and using head trajectory does not mean that you have to sacrifice your play style— not in the slightest. Simply try and “use your head” to make the save and be one step ahead of every play and every shooter.